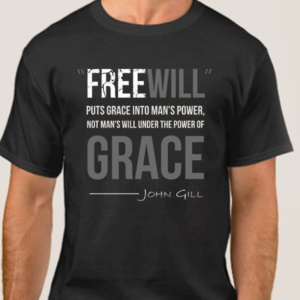 This is an excellent sermon refuting the arrogant, heretical, idolatrous, self-righteous, belief, that man has a ‘free will’ to become saved. And all of this with no notes. Though Dr. Sonny Hernandez does not practice it here. One of the qualities of Hernandez, is that he does not hypocritically point his fingers at those ‘other Christians.’ He’s known to call-out compromisers ‘by name,’ amongst his own denomination. Dr. Sonny Hernandez is the director of Reforming America Ministries. When he’s not pastoring his flock at a 1689 LBCF church, he’s leading as a deputy wing chaplain in the United States Air Force Reserves. He’s a prolific columnist for World Net Daily, and has authored many solid books. His recent book that I have read (and wrote about), is ‘High Calvinism.’ His most recent book (that I have not yet read) is ‘The True Gospel, Of Christ’s Saving Death (a Theological primer on particular atonement).’ He’s also an effective non-compromising apologist, and a prolific debater. While in Tennessee, I’ve had the privilege of meeting Hernandez, and have sat under his teaching. The Lord has gifted Hernandez with one of the most brilliant minds of today. Soli Deo Gloria! For more about his biography, click here. For more IPOC posts related to Hernandez, click on his tag here. Video Heralding ‘Not being attentive to the Gospel is a damnable sin; a woman responds to the Gospel, many others ask for prayer, Christians are edified, others ask questions’ – GLORY TO THE HIGHEST!! !